Spanish: Cristo ha resucitado! / Verdaderamente ha resucitado. SUNDAY OF THE OINTMENT-BEARING WOMEN. Theologian. Our Holy Father Ignatius Brianchaninov. TUE. MAY 2 Our Holy Father Athanasius the Great. Theodosius of the Pecherskaya Lavra. THU. MAY 4 The Holy Martyr Pelagia. FRI. MAY 5 The Holy and Glorious Martyr Irene. SAT. 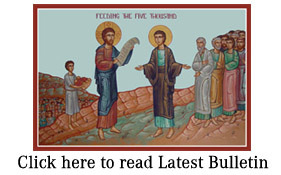 MAY 6 The Holy & Just Job the Long-Suffering. SUN. MAY 7 SUNDAY OF THE PARALYTIC MAN. the Emperor Constantine. The Holy Martyr Acacius.